The USA TODAY Bestseller with thousands of raving readers. From a young Jewish woman in love fighting her way out of the Warsaw ghetto, to a Czech assassin rising above his fears for an attempt on a Nazi Hangman's life, to a daughter who vows to avenge her family by taking down a Japanese commander, and a French boy's touching act of defiance no matter how small. This collection includes ten never before published novellas by ten of today's bestselling WWII historical fiction authors. When I started this book I didn’t look at the table of contents. I started reading and then it ended, I thought rather quickly. The another story appeared. I then could see these were a collection of short stories, novellas. They were all located in different parts of the world as related to WWII locations. Some were very good and I was disappointed they ended. It is now hard to remember them all. So unless I looked more into the authors at the time I finished then it would be hard to go back. Part of this book was very good. Other parts were not so good. I did not finish the last novella by Ryan Armstrong, as it was much too vulgar for my taste. Jean Grainger’s novella was excellent! I cannot recommend the entire book, however. I first preordered this book from Marion Kamarow’s newsletter many months ago & am so grateful that I did! 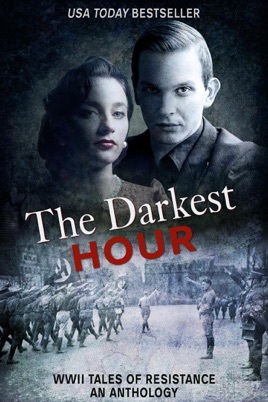 The fact that all authors’ proceeds from the sale of The Darkest Hour are donated to the National Holocaust Museum in Washington, DC is something for which they should be applauded. 👏. Be prepared to feel the courage, pride & love of country & countrymen as resistance fighters (young & old) help escaping Jews & allied soldiers, in their flight to freedom! Not all of these stories end happily & I shed tears with them for those souls lost. You will become involved with the heroes, heroines & Nazis & feel as if you were there! Order your own copy of The Darkest Hour today - you won’t regret it! It’s a page turner of suspense, love & hate & ultimate victory over an evil madman & his regime! THANKS TO THESE AUTHORS & MANY OTHERS FOR KEEPING THE HORROR OF THE HOLOCAUST ALIVE LEST WE EVER FORGET. THE WORLD CANNOT LET THIS HAPPEN AGAIN!